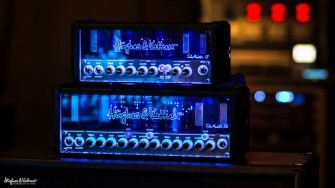 We’re happy to report that we’re reducing the prices of our bestselling TubeMeister 18 and TubeMeister 36 tube amp heads! Having recently unveiled the TubeMeister Deluxe 20 and 40 models at the 2016 NAMM Show in Anaheim, California, this now means there’s a TubeMeister available for guitarists operating on practically any budget level. As of spring 2016, the TubeMeister 18 head retails at $629/€593 compared to $749/€665 previously, while the TubeMeister 36 head is now $999/€891 (compared to $1,199/€998). TubeMeister 18 and 36 combo pricing will remain as before. Contact your local H&K store to find out the new Meister pricing in your region!